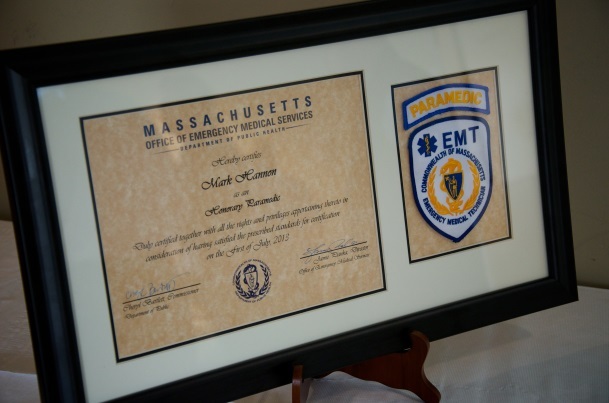 October 2013 (Cambridge, MA) – Armstrong Ambulance Service and Professional Ambulance (Pro EMS) Center for MEDICS jointly recognized the clinical and classroom achievements of deceased EMT and paramedic student, Mark Hannon, by presenting his family with a plaque that certifies Hannon as a paramedic. A life-long resident of Concord, MA, Hannon had achieved his EMT certificate from Boston EMS and spent seven years as an EMT at Armstrong Ambulance in Arlington. In July 2010, Hannon enrolled in the Center for MEDICS paramedic program to advance his skills and obtain more training and clinical experience. After completing nine months out of the year-long program, Hannon took a leave of absence. During his leave of absence, Hannon became ill and was unable to return. He passed away on May 27, 2013, at the age of 29. 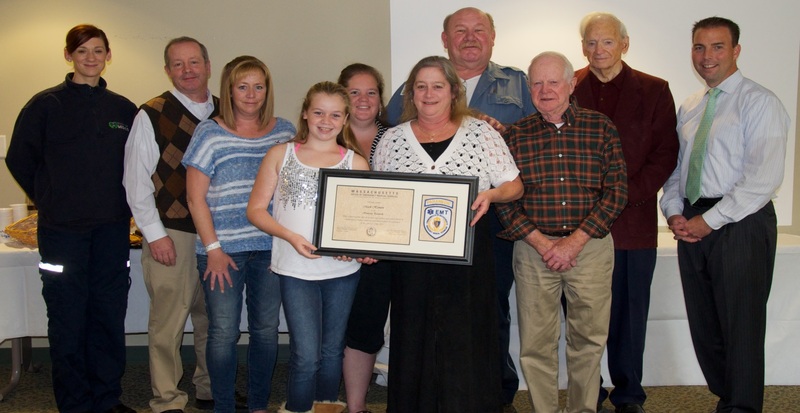 On October 10, 2013, representatives from Armstrong Ambulance and Pro EMS Center for MEDICS presented Hannon’s family with a plaque recognizing his achievements in emergency medicine. Center for MEDICS Director Danielle Thomas presented the plaque on behalf of Pro EMS and the State of Massachusetts. Bill Armstrong, founder and owner of Armstrong Ambulance, his daughter Gale Brady, Treasurer, and Rich Raymond, Chief Operating Officer, were also present. “Mark was a great student in our program because he was so dedicated to his work. His passion and professionalism were exceptional, and we are pleased to recognize his efforts by granting him EMS certification,” said Thomas. Hannon’s parents, sister, grandfather, aunt, and uncle received the plaque in his honor. Many of Hannon’s colleagues and friends from Armstrong Ambulance also attended the ceremony. Boston Marathon bombing first responders visit Southeast Texas. Armstrong Ambulance recognizes 46 members of its first-responder team, including EMT’s, Paramedics and Dispatchers during an Oct. 23 ceremony at the company’s Arlington headquarters.